15:57 VanessaE ~tell Zeno` message from MichaelEh, "I was going to say Onez has to change his redirect to your new server"
16:15 red-001 are light sources always darker then the sun? 17:23 whitephoenix are there any active modpacks made to be like ftb/tekkite? 17:28 whitephoenix Also, I have this hud element that falls apart when the game is resize, any ideas? 17:29 mootpoint does anyone else here have a problem with some items not displaying in the unified inventory? 17:44 kaeza mootpoint, hi. can you show an example of an item which is not showing? 17:45 mootpoint hello kaeza, in my holiday modpack that i showed you the other day, it originally would not show the snowman head or bottom, and it still wont show the wooden driedel. 17:50 whitephoenix I haven't touched this file recently, maybe an update changed something? 17:51 mootpoint does it still work on the old testing world? 17:52 mootpoint keep in mind i am here getting help as well :), but do you have the sparks.txt in the worldpath? 18:46 Passant no wait, for some reason somewhere else are some even after resetting the are. 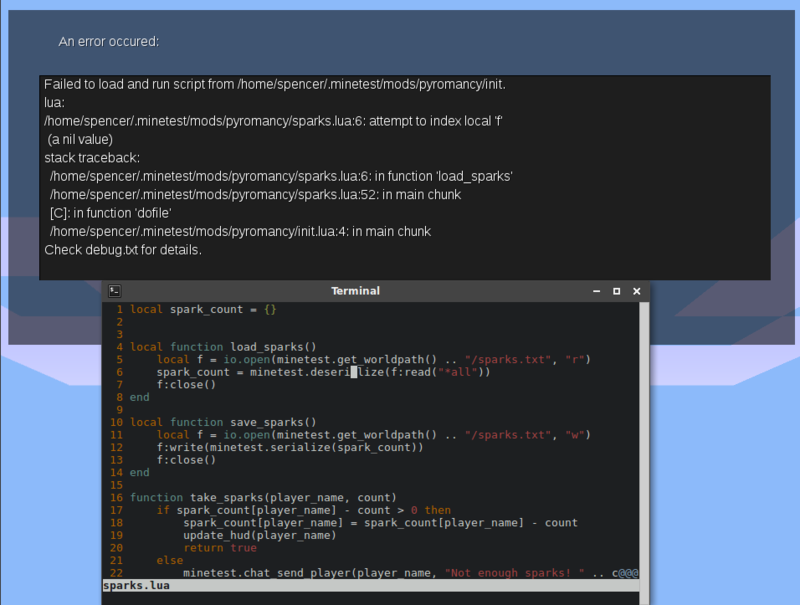 and this still after going sure with vim >_> - but still ignoring the spawn_by. 22:22 AcidNinjaFWHR Hello anyone named Mark from MinetestHosting here ? 22:27 AcidNinjaFWHR what sfan5 ? 22:27 AcidNinjaFWHR <MinetestHosting> I'M NOT A FREAKING NOOB!!!!!!! 22:27 AcidNinjaFWHR I totally believe him.